SIGNED VACHERON & CONSTATIN, GENEVE, MVMT NO. 501912, NO. 328065, 1951, SOLD 1955. 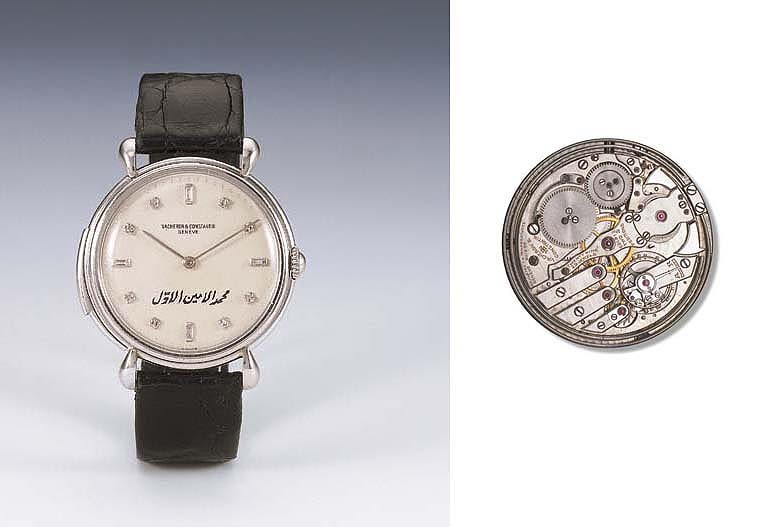 Rhodium finished 29-jewel mechanical movement adjusted to temperature and two positions, jeweled to the hammers with bimetallic cut compensation balance and two hammers stricking on two gongs, silvered dial with diamond indexes, platinum hands and Arabic inscription, circular stepped case with snap on back, repeat slide in the band and teardrop lugs, dial, case and movement signed. This watch is considered by collectors and professionals alike to be the most attractive minute repeating wristwatch to have been produced since its conception in 1942.